The new Micro Series represents the natural evolution of the previous series produced by Italvibras. Experience acquired throughout years of work and specific workshop tests, have allowed significant improvements to be applied to both the technical aspects and design of the new Micro vibrators, so much so that the product has become even more reliable. The Micro Series has been designed for continuous use in industrial processes that require smaller size electric vibrators with lower centrifugal force. Micro electric vibrators feature IP65 mechanical protection, a highly resistant light aluminum alloy casing and stainless steel weight covers. 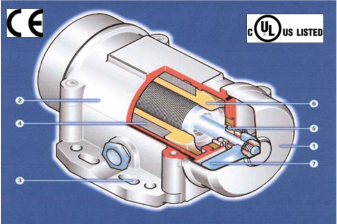 Lubrication is not required as long lie maintenance-free type bearings are used. Weight covers in stainless steel that combine high mechanical strength with the protection guaranteed by stainless steel. The windings are subjected to the strict tests established by the standards in all pieces produced under CSA, UL and CSA guidelines. The lamellar eccentric weights can be regulated in steps by changing the actual number of weights mounted.